The Reliatronic Dry Erase Calendar is a good solution for your daily planners. You can write down your weekly scheduls on the white board then attach it on your refrigerator, which will remind you that what you should do everday. Never be worried about missing anything you mean to do. Update the calendar in another week just using the other side of markers, so easy and clean. The weekly calendar consists of 9 parts: from moday to sunday planner, note and next week planner. Just label on the white board what you want or need to do everyday, what you want to each everyday or which the special day for you. 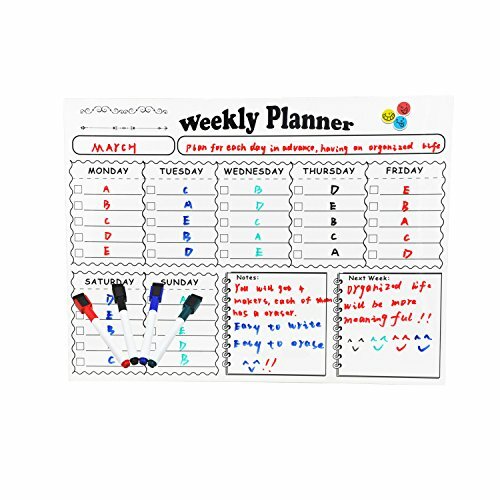 Our magnetic calendar contain 1 weekly planner and 5 different color markers. It's very easy for you to write on the board and wipe it clean withe the eraser on the marker. Plan for Life - Do you want to have a organized life? Sure you do! Just having 1 dry erase white board. Write down what you plan to do in one week, some important things such as birthday, date, anniversary and so on. Put the calendar on the fridge, you will see it everyday. Are you still afraid of forgetting to do something? No,obviously. Why You Choose Us - You will get creative design weekly plan calendar, simple and practical. Besides, 4 different color's markers, help you distinguish different things you are going to do.Thicker material, stronger magnetism and better writing place, making it's easier to write words and wipe. Convenient and Practical - Bothe the white board and markers are fit for refrigerator and magnetic receptive area. So convenient to write down your grocery list,doctors appointments and any upcoming things you want to remember. Dimensions - 12 inch x 16 inch. A proper size white board for wrting the plan and put it one fridge. Reliable Customer Service - Reliatronic will be responsible for each of our product, please contact us at any time if you have any problems.30-day money back guarantee, 1 year replacement warranty and lifetime customer service guarantee. If you have any questions about this product by Reliatronic, contact us by completing and submitting the form below. If you are looking for a specif part number, please include it with your message.